Alpha Psi Omega is the national dramatic fraternity and is an honorary society for persons participating in theatre. Its main focus is to support your local theatre and build a team atmosphere. Our chapter is new and growing. Watch the callboard for a listing of officers, meeting times, and for more information on this great group. The Kennedy Center American College Theatre Festival (KC/ACTF) is a year-round program in eight geographic regions in the United States. Regional activities are coordinated through eight KC/ACTF regional chairs and eight KC/ACTF playwriting awards chairs. With funding and administrative support from the Kennedy Center, the regional chair coordinates all aspects of the assessment and selection of productions on the local and regional level and supervises regional-level KC/ACTF awards programs. Regional festival productions are seen by the National Selection Term chosen by the Kennedy Center and the KC/ACTF National committee. 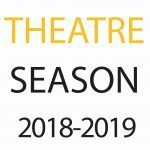 This panel selects four to six of the best and most diverse regional festival Participating productions to be showcased in the spring at the annual national festival at the Kennedy Center, all expenses paid. The national festival is the culmination of the KC/ACTF year. Recipients of national KC/ACTF awards, scholarships, and fellowships are also announced during the national festival. Each major production at MWSU is entered in the American College Theatre Festival. A theatrical performer from outside MWSU attends one performance, then does a verbal review of the play. The department selects one actor for their outstanding performance, and then the adjudicator selects one. These students are eligible to compete at the regional ACTF festival for the Irene Ryan scholarship. The work of design students is eligible for entry into the regional ACTF design competition. For more information, see Contact Professors Quillin, Hanson and/or Breuer. This is an organization that encompasses the southeastern states, Puerto Rico and the American Virgin Islands. It is the largest regional organization of its kind. An annual convention is held every March in a southeastern city. The Spring Auditions and Job Contact are held at the annual convention where over 90 companies audition and interview candidates for jobs. This is a great place to land a summer theatre job! The convention also hosts fantastic workshops and panels. It is a wonderful experience and is always well attended. For more information, see Professor Breuer.